This is a photo of cigars on sale at the duty free shop in the Liberia airport. There are street vendors in Tamarindo who sell cigars, which I assume are Cuban cigars, as they are available throughout Latin America but not the USA. I assume that these are Costa Rican cigars, as it would make no sense to sell Cuban cigars at an airport where almost all the flights go to the USA, where Cuban cigars are illegal. I don't smoke, so I have never tried one. This week we are showing photos of San Pedro de Atacama, the main town in the Atacama desert of northern Chile on our Viva la Voyage travel photo site. Here is part of the duty free shop in the Liberia airport. I have never bought anything in here, but I do browse every once in a while, perhaps because the two shops in the airport are air conditioned. This shows photo shows why they needed and built a new airport terminal at the Liberia airport. This is a departure hall in the current airport terminal. You may notice the giant ceiling fan. Yes, that means that it is not air conditioned. It is a basic, no frills facility, with open sides, including open to the tarmac, for air circulation. The new terminal is air conditioned and will make a much more pleasant experience for arriving and departing passengers. Here is another photo of the new terminal building at the Liberia airport. It will provide a much better first impression of Costa Rica than the existing collection of airport buildings. The airport was supposed to open in October, but there are still issues between the government and the company that built and will operate the airport that need to be resolved. The newspaper had an article that companies that expected to operate in the airport, such as Cafe Britt which will have three gift shops, had hired workers and purchased inventory, but they cannot start their operations. The Ad Astra Rocket Company, started by Costa Rican Astronaut Franklin Chang, opened near the airport so that high tech products could be shipped in and out from the new terminal. The high season for tourism has just begun, so hopefully the airport will open soon. This is the new terminal at the Liberia International Airport. It is quite a contrast to the collection of buildings that I showed yesterday. Already about one-third of the international tourists who come to Costa Rica fly into Liberia rather than the capitol of San Jose, and that number is expected to increase in the future with the new airport terminal. The new terminal has not yet opened, although the building is complete. The government is doing inspections of the interior construction work by the contractor before opening the terminal building. The airport will be operated by a private company that won a bid for a long term concession to build and operate the airport. This is a view of the International Airport in Liberia. It is not much to look at now, but a new terminal has been constructed, which I will show in the coming days. The addition of direct flights from the USA to Liberia about a decade ago has transformed the northwest Pacific region of Costa Rica. Our area is the most popular destination for tourists in Costa Rica, a country known for its tourism industry. Major international hotel chains, such as the Four Seasons, J.W. Marriott, Hilton, etc. have opened resorts. Lots of vacation homes and condos have been built. All of this is made possible by the fact that it is just one hour from the Liberia airport to the beach resorts. These airport terminal buildings, shown today from the window of an airliner, are very basic. The terminal is functional, but not impressive. We will explore this subject a little further in the next few days. This week we are showing photos of San Pedro de Atacama, the main town in the Atacama desert of northern Chile, on our Viva la Voyage travel photo site. For today's Christmas greetings, here is a photo of the holiest site in Costa Rica, the Basilica de Nuestra Senora de Los Angeles in Cartago. The cathedral is built on the site of what is considered a miracle in 1635, when a small black madonna statue mysteriously reappeared on a rock after an indigenous girl removed it several times. People from all over Costa Rica make pilgramages to Cartago, located about 16 miles (25 km) from San Jose. During the holy week at the beginning of August, the little "La Negrita" statue is taken from the altar and paraded in the square in front of the Basilica. As many as one million people, nearly 25% of the population of Costa Rica, will visit the Basilica during that time period. There is a spring next to the Basilica whose water is considered to have curative powers, and pilgrims will often pray for relief for the physical ailments of themselves or loved ones. For those who celebrate Christmas, please accept these best wishes for the holiday, and I hope that everyone has a hoyous holiday season and and happy, safe, healthy and prosperous new year. Today is Sunday, so we have new photos posted on our Viva la Voyage travel photo site. This week we are showing the town of San Pedro de Atacama, Chile. It is a place from which people explore the Atacama desert and the Andes mountains. This photo shows the scene near the mouth of Langosta Estuary, where it flows into the sea, and where the tide flows into the estuary. At times when the tide is about the same height as the estuary, the water is very still, with the current neither flowing in or out. This photo captures one of those still moments. We have photos of the villas in Bellagio, Italy on the shores of Lake Como posted on our Viva la Voyage travel photo site. Yesterday's photo was a little far away, so here is a closer view of the surfers walking from the beach. From a photographic standpoint, I was pleased to be able to catch the surfers in the sunlight, with the trees dark behind them to highlight the subjects. I almost always take photos on a manual setting as though it is a little brighter than the camera's exposure would ordinarily set the camera. Shooting on a brighter setting prevents photos from appearing washed out, deepening the blue of the sky, and maintaining the texture of clouds. Some parts of the photo may appear too dark, however, such as the trees in the background of this photo. Sometimes I leave them dark, such as today, and other times I use the iPhoto adjustments to lighten the shadows of the photo. Without shooting for a brighter setting, a scene like this would have the trees lighter, but the splashes of sunlight on the skin on the surfers would be washed out, as would be the white of their surfboards. My mother-in-law may comment that I took a moment of eye candy for her and turned it into a boring photo mini-lesson. Oh well, Glenda has never criticized me about anything else (I'm serious), so I have to give her some reason to do so. I try to maintain gender equality on this website. My wife would insist on it. I realize that I posted a few photos of women silhouetted against the shimmering sea last week, so I better balance the scales. Here are a couple of surfers on Playa Langosta. Does the swim suit on the left looks like someone cut off the trousers of a prison uniform? Our area of northwest Costa Rica, the province of Guanacaste, is named for the guanacaste tree, which is Costa Rica's national tree. The landscape is primarily coastal hills and plains, with pastures such as this for livestock and crops. The area has a rural, small town atmosphere, with condos, vacation homes and resorts along some of the beaches, and, of course, businesses that cater to tourists in the few beach towns. I have been showing more photos of the rural areas lately, so tomorrow we will return to the beach, resuming with a few photos that my women readers may appreciate. On my last trip to Costa Rica, when the Hertz car rental agent went over the car with me, he showed me the emergency kit. That was new. He said that a new law requires that all cars to have an emergency kit and seat belts. Police can give you a ticket if you don't have one an emergency kit or are not wearing a seat belt. Of course there will be a charge if you return the rental car without the emergency kit. I mentioned yesterday that in mountainous areas of the country in particular roads can be a challenge. There will be times that I am sure people will be grateful that they have an emergency kit in their rental car. I like the colorful village and rural houses that are typical of Costa Rica, such as the one in this photo. This house was on a country road about 15 minutes inland from Tamarindo. People who inquire about renting one of our condos often ask about the roads in Costa Rica. The road to Tamarindo is paved and in fine shape. There is only one paved road into Tamarindo, and there are lots of country roads in the area that are unpaved. This photo is a typical scene of a country road near Tamarindo. In the mountainous areas of Costa Rica, there are plenty of roads that are more of a challenge. Today is Sunday, so we have new photos posted on our Viva la Voyage travel photo site. This week we are showing a few more photos of the villas in Bellagio, Italy, on the shores of Lake Como. People seemed to like yesterday's photo, judging from the kind comments, so here is one more black & white study of two swimmers on Tamarindo beach. I liked this photo because of the dance of the light on the wave that has just broken before reaching the swimmers. This week we have photos of the fall colors on Cape Breton Island, Nova Scotia on our Viva la Voyage travel photo site. I don't normally post black and white photos on this site. In fact, in three and one-half years of doing this site, I don't think I have ever posted a b & w photo until today. In Tamarindo, taking afternoon photos of the Pacific Ocean means shooting into the sun, of course. This silhouette of a couple of women wading out into the ocean did not have a lot of color, so I tried it in black and white. I think it emphasizes the silvery reflection of the sun on the water. After yesterday's photo of a small crab to illustrate the discovery of kiwa puravida, a new species of crab deep in the Pacific Ocean off the coast of Costa Rica, I thought I would post this photo of a crab on the road. I took this photo back in July, when a certain species of crabs comes out at night and crosses the beachfront road between Tamarindo and Playa Langosta. I don't know why they leave the beach and walk into the woods, although I presume that maybe it is too mate. I am sure that the raccoons and coatis are delighted with the crabs venturing out. This photo shows the advantage of having a camera with a view finder screen that swivels out from the camera into a horizontal position. It lets me take photos such as this by looking down at the camera, rather than lying down on a damp road with a bunch of crabs to try to look through the view finder. This week we have photos of the fall colors of Cape Breton Island, Nova Scotia, on our Viva la Voyage travel photo site. Scientists have just discovered a new species of crab 50 miles off the coast of the Nicoya Peninsula, where Tamarindo is located. I do not have a photo of the new crab, so I am using this photo of a local crab to illustrate this discovery, in part because of the key role of the new crab's front claw, which is also prominent in the photo of this crab. The new species of crab was discovered living 1,000 meters deep in the ocean, near vents that release hydrogen sulfide and methane gas into the ocean floor. Using these gasses, the crabs cultivate bacteria to grow on their front claw, then they have an appendage that lets the eat the bacteria from their claw. The new species has been named kiwa puravida. Pura Vida is the national slogan of Costa Rica. It means "pure life" and is used much like Hawaiians use "aloha." The new crab is only the second type of yeti crab species ever discovered, following the 2005 discovery of the other type of yeti crab west of Easter Island in 2005. The discovery of kiwa puravida was made through the cooperative studies of scientists from the University of South Carolina, University of Oregon, and New Zealand National Institute of Water and Atmospheric Research. This collaboration is an example of how Costa Rica attracts biologists from all over the world because of its unique and diverse land and marine ecology and its support for the environment. My niece is getting her Ph.D. in marine biology at the University of California at Santa Barbara. She has made made discoveries and published scientific research papers regarding sea urchins. She has also studied sea turtles around the world. I know she will help make the world a better place in the future. This week we have photos of the fall colors of Cape Breton Island, Nova Scotia on our Viva la Voyage travel photo site. Yesterday's photo showed a sign saying not to take shells from the beach. So, here is a photo of some of the shells on the beach. This random pattern shows the different stages of the deterioration of shells. I don't know why, but some of the shells on our each commonly lose their center section and develop holes in the center that gradually become larger, leaving only a ring. In addition to the path to the beach that our condo developers installed, there are several small parks in Langosta that provide access to the beach. Here is one of them. I think it is good that they keep some land with dense trees so that there will not be houses and condos along the entire beachfront. We have seen howler monkeys in the trees in this little natural area, even though it is right in the middle of beach houses and condos. There is now a green zone for the first 200 meters from the beach that prevents new development right along the beach. Condos such as ours right on the beach are rare, as they could built up to 50 meters from the high tide line because they were grandfathered by real estate transactions that occurred before the green zone law took effect. I will admit to a certain amount of hypocrisy of enjoying a place right on the beach, but also enjoying the land left in its natural condition along the beach. Note that the culture is to keep things natural, including not even taking shells from the beach. The small sign says that the Green Zone area is maintained by a local community group that protects Tamarindo and that the Green Zone is pursuant to an ordinance by the municipal government in Santa Cruz. I will let you draw your own conclusions regarding why the sign about not taking shells is in English only, not Spanish. 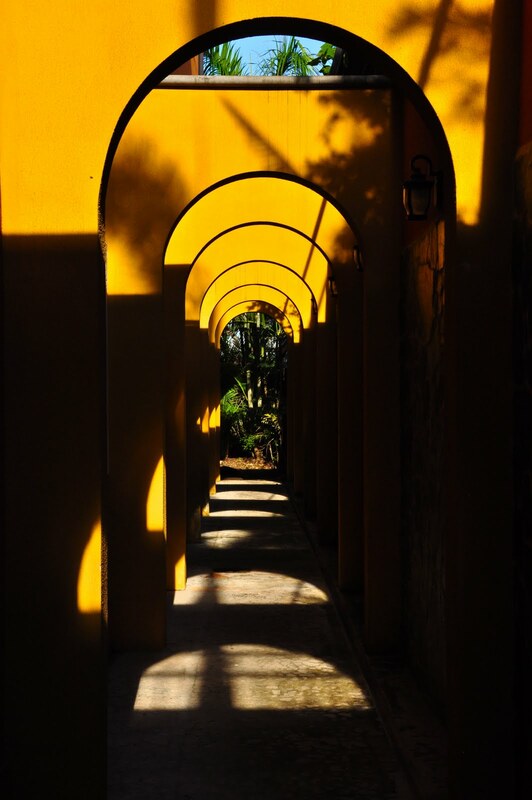 This week we have photos of villas in Bellagio, Italy, on our Viva la Voyage travel photo site. Alongside our Langosta condo there is a path to the beach from the road. You can see the ocean at the end of this path. The path and landscaping was installed by the company that built our condo, which is the same company that owns the Tamarindo Diria Resort, which is the largest resort in the area. We can walk to the beach out the back gate of the condo, by the swimming pool, but I think it is great that the developer put in a nice path for people who live or stay in condos that are not right on the beach to use to walk to the beach. All beaches in Costa Rica are public property. There are some resorts or gated master-planned communities where people cannot access the land near the beach, but generally access to the beach is plentiful. There are so many beaches and no major cities nearby, so it is easy to enjoy time on uncrowded beaches. Today is Sunday, so we have new photos posted on our Viva la Voyage travel photo site. This week we are showing photos of the fall colors on Cape Breton Island, Nova Scotia. 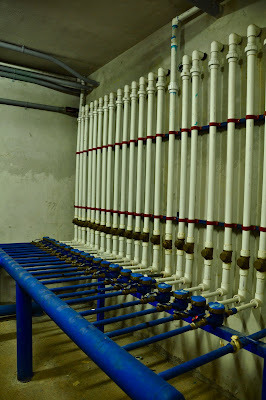 Here is one more photo of the water system underneath our condo building. My wife, Julie, has at times taken industrial photos of subjects such as pipes and valves. I decided to try yesterday's and today's photos for a similar exercise, although I did not anticipate getting any photos for my website when walking around the underground utilities of our condo. This is the type of photo that might ordinarily look good in black and white, but the blue pipes caused me to keep the color. I think I will stick to my normal photos of the beach, fauna and flora, rather than industrial scenes, which are far less common in Costa Rica. This week we are showing a few more photos of Julie's recent trip to Nova Scotia, including a quaint country church and lobsters on our Viva la Voyage travel photo site. My little walk around the bottom level of our condo building brought me to this room, which is located under the driveway. 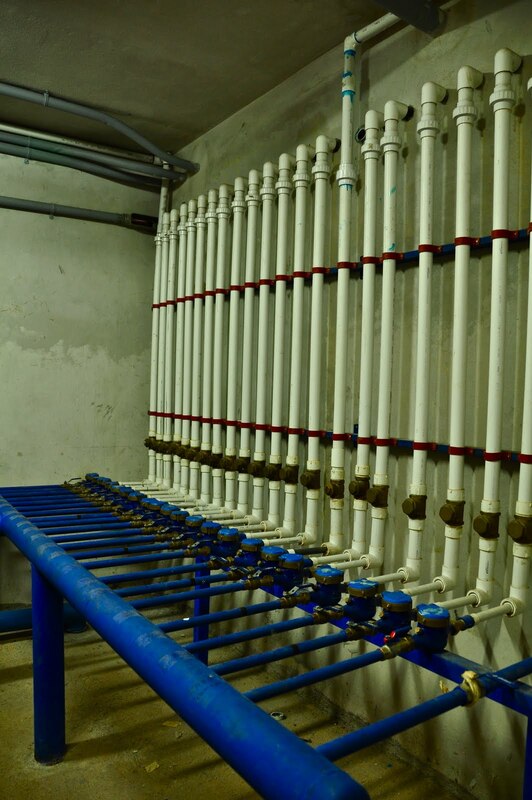 It is the water system that feeds water to the 20 condos in our building. I am on the Board of Directors for our condo building homeowners association, so I was walking around to check on the conditions of the building infrastructure. For a room below ground, it was clean and well maintained. I even liked the bright colors of the pipe and machinery. The light, shadows, and arches of the buttresses that support the retaining wall on this below ground level walkway caught my eye. I wouldn't have thought that there would be camera-worthy subjects on a walk to a utility room, but art is in the eye of the beholder, even when doing a mundane task. We let some very good friends use our condo, and Tim painted the scene at the end of the entryway to our condo, with palm trees, the beach and ocean visible. He gave us the painting as a present for letting him stay there, and I have the painting in the library bathroom in our house in Scottsdale. He created a delightful work of art out of an everyday scene. Tomorrow we will see if there are any artistic or camera-worthy subjects in the underground utility room at the end of this corridor. We have owned our Langosta Beach condo since the building was constructed about 5 years ago. In all that time, I have never walked down this corridor at the end of the building. This corridor is sunken, below ground level, and goes to the underground utility rooms that contain the water system for the building. Why would I walk to the utility rooms instead of out to the beach? I am on the Board of Directors for the homeowners association for the condo building. I figured I should check out the utility room to see what kind of condition it is in. But because I am a Daily Photo blogger, I took my camera, of course. 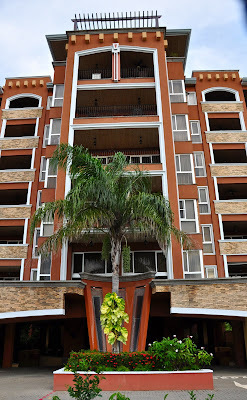 Most of the condos in Tamarindo are small garden condo complexes, such as our Langosta condo that is four stories tall, with a total of 20 condos. There are a few tall condos, however, such as the Naxos building shown in this photo. The taller condos are somewhat controversial, however, as they extend above the trees and are visible from a distance. The height, of course, enables owners and renters to have a view of the ocean even if the condos are set back from the beach. It is no longer legal to build tall condos on the beach. The Naxos building shown here is set back about 200 meters, or two blocks, from the ocean. This is one of the guest cottages at the Cala Luna Resort in Langosta. The Cala Luna has little cottages amidst lushly landscaping. It has been closed for remodeling for a year or so, and its reopening is good for Langosta. It is a charming place, and my wife and I like to walk here to have lunch in the restaurant that surrounds its pool. This week we are showing some more photos of Julie's recent trip to Nova Scotia on our Viva la Voyage travel photo site. Yesterday several people left comments about how the bus bringing workers to Tamarindo was clean, and someone commented about the dust stirred up behind the bus. I therefore thought I would post this photo today that shows how the buses stay clean. Here is a bus driver cleaning the bus in Langosta before making the return trip to Liberia. I took this photo several years ago but never posted it because I thought it was not really of much interest, but after yesterday's comments about the buses, I decided to post it. Liberia is the main city in in Northwest Costa Rica. It has a population of about 45,000, and an international airport with about 50 non-stop flights to the USA each week. These buses are for workers, rather than tourists, as most tourists take van service to the airport. Today is Sunday, so we have new photos posted on our Viva la Voyage travel photo site. This week we are showing a few more photos of Julie's recent trip to Nova Scotia, including a quaint country church and lobsters. This is a photo of one of the buses that bring workers from Santa Cruz to Tamarindo for jobs at the condos, restaurants and hotels in our area. When I showed my recent series of photos from the ranch, I mentioned that buses regularly travel down the rural unpaved road that runs by the ranch because most workers in Tamarindo live in the surrounding area and take the public buses to work. Condos and houses in resort areas such as Tamarindo are built and priced to sell to people from the USA and Canada, and are too expensive for most local workers. This is common in many resort areas, including those in the USA, but the problem is amplified in areas of the developing world when the resort housing market caters for foreigners. I think it is wonderful that there is good bus service for workers, even in a rural area such as the part of Costa Rica where Tamarindo. It enables people in a wider area to share int he benefits for the local economy from the tourist industry. This bus is on the road at the entrance to the Langosta section of Tamarindo. We have photos of the Atacama Desert of northern Chile on our Viva la Voyage travel photo site this week. It is an amazing, colorful, barren landscape. These two workers look after and tend to the landscaping at the condo complex across the street from our Langosta condo. They are taking a little break to chat and relax, as are the dogs. Every condo building in the area has a landscaper and guard. Because there is only one road into and out of Langosta, the security personnel get to know the people in the area and they can keep an eye out for any unusual activity. This provides a sense of security, as many of the condo owners, like us, are not full time residents and is is comforting that people are looking after the place while we are gone. At our condo there is a tall gate and the security guard logs in each person who comes in and out. We feel very safe in Tamarindo. Tomorrow I will show you how these workers get to work. The worldwide Daily Photo theme for December 1 is to post an action photo. For us in Tamarindo, the most common action is the surf on the beach. I took this photo on Langosta beach, which absorbs the full force of the ocean's waves. Tamarindo beach is partly sheltered by a bay with a reef and an island for protection. The trick of getting this action photo was to pick a spot on the beach where I could shoot the crashing waves beside me, looking down the beach, not just pointing my camera out to sea, without getting wet myself. I did not use my little waterproof camera, but my Nikon D90 and lens. I took advantage of a little point on Langosta beach where you can walk out onto a higher point of sand while the waves break on each side of you, usually without covering the higher spot.